I’ve thoroughly enjoyed Living World Season Three, and especially the new locations we’ve been to. As such, and to celebrate the announcement of Flashpoint, the fifth episode of the season, we are holding a screenshot competition here at Dragon Season! 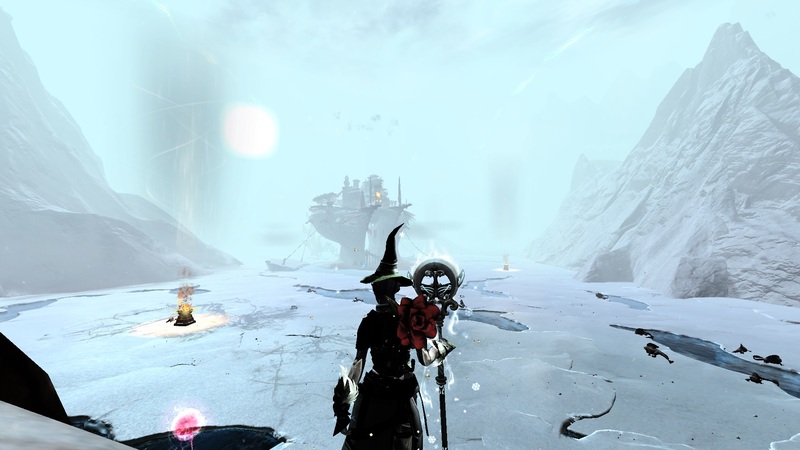 What we would like you to do is to take a screenshot of your character in one of the new maps introduced during Season Three – Bloodstone Fen, Ember Bay, Bitterfrost Frontier, or Lake Doric. That’s pretty much the only rule – your character has to be in one of the new maps! Make sure to have your character visible somewhere in the shot. 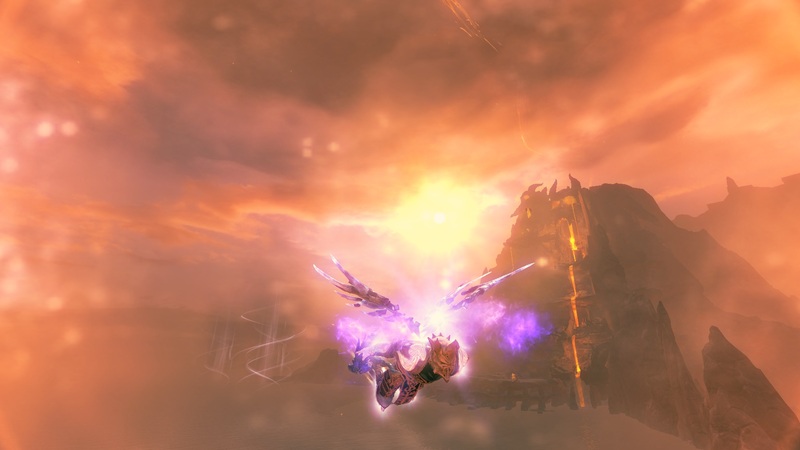 As for prizes, well, we have plenty of swag to give away, kindly donated by ArenaNet. 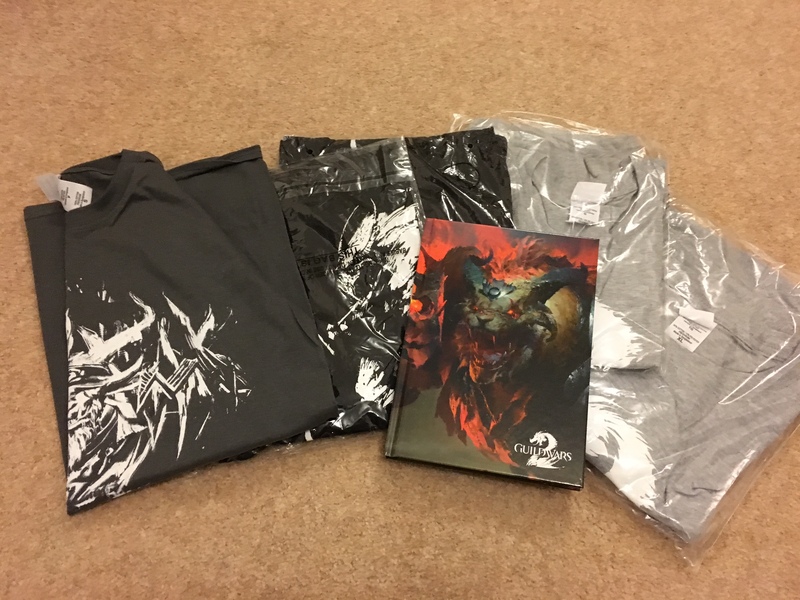 We have five Guild Wars 2 T-shirts (a small charcoal Rytlock revenant tee, one medium and one large black Rytlock tee, and one large and one extra-large grey Guild Wars 2 tee) and one Guild Wars 2 notebook to give away, as well as in-game prizes for those living outside the EU. The screenshot competition will run for one week, until midnight UK time Wednesday 3rd May. Please say which prize (T-shirt and size, or notebook) you would like to win. Unfortunately, due to shipping costs, the T-shirts and book are only available to those living with the EU. If you do live elsewhere, you can still enter! I’ll send out an in-game prize to you if you win (maybe something wintery that I have in my stock…). Keep all posts clean. Any I deem offensive or inappropriate will be removed. Good luck to everyone, and I hope you have a legendary time getting some epic screenshots! I’ll email you soon to get your details. Congratulations again! The Flashpoint competition is now closed! I love the screenshots you have submitted. Thank you to those who entered, and congratulations, you all win a prize! Khai: The charcoal black T-shirt (size S) with Rytlock facing forwards on it. Northerner: The black T-shirt (size L) with Rytlock on the side. Heliotrope: The mini Angry Wintersday Gift. Finally, Faeran, although not strictly an in-game screenshot, you’ll get a choice of one of the two grey t-shirts (size L or XL). I’ll email all the winners soon (using tyriantweets@gmail.com) to ask for your postal address or in-game name, so keep a look out for that. Unfortunately, I live in the US, so I can’t receive a shirt, I probably should have mentioned that! Ah ok! In that case, you can choose either the snowflake glider or the mini angry wintersday gift. Which would you prefer? Excellent, I’ve locked in the glider for you, CreatorBurden. I’ll email you the code soon, so keep an eye out for that. Thanks for choosing! I’ll email you soon to get your details. Congrats! Chaotic magic still lingers where it all began…. Oh wait……. It had to be an in-game screenshot…. 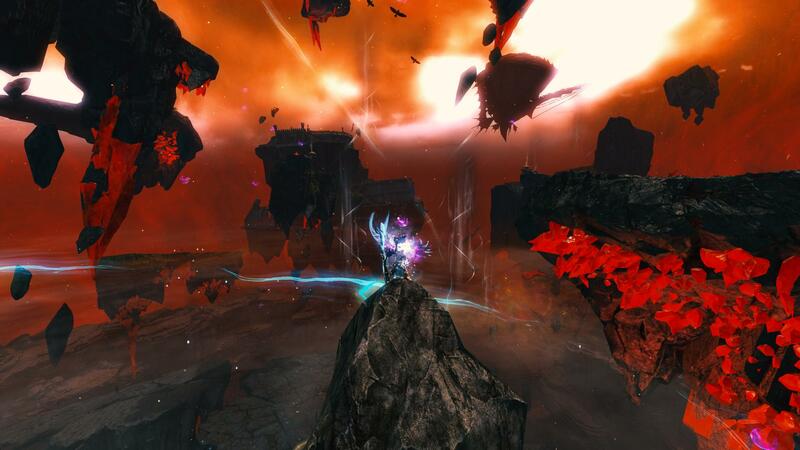 Well, with a bit of imagination it could have been a place we could visit somewhere in Tyria. (i’m a size L; black tee perhaps, or a notebook.. won a grey tee over at Nerdybookahs a year ago so wouldn’t need another). Love the torches spread out across Bitterfrost Frontier!